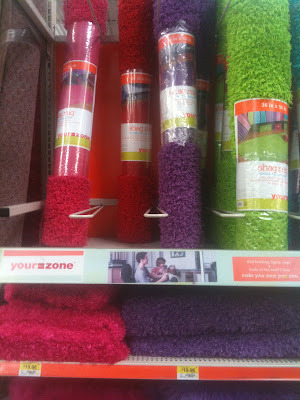 My girl loves purple and she would love it if everything in her room was purple. including posters, colors and patterns. So we have been talking about how she wants her room to look. She isn't 100% decided on the whole look yet... but she really wanted new bedding. 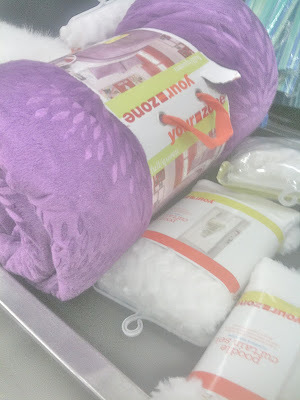 She had a pink poodle blanket that she was tired of and she wanted something with dark purple, of course. 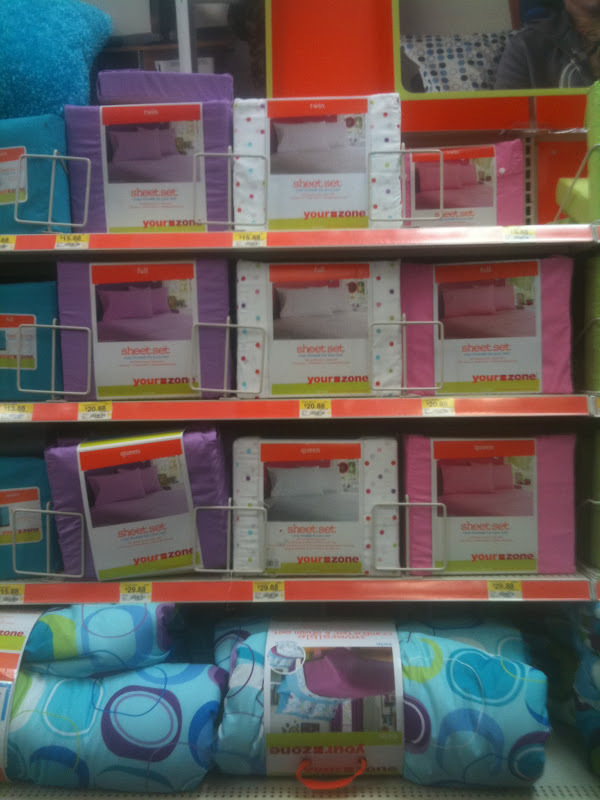 Luckily, we had a neat opportunity to choose a few items from the Your Zone collection at Walmart for her room-and so she went on a little bedding shopping spree. We shopped online first and found several comforters and drape options that she liked. 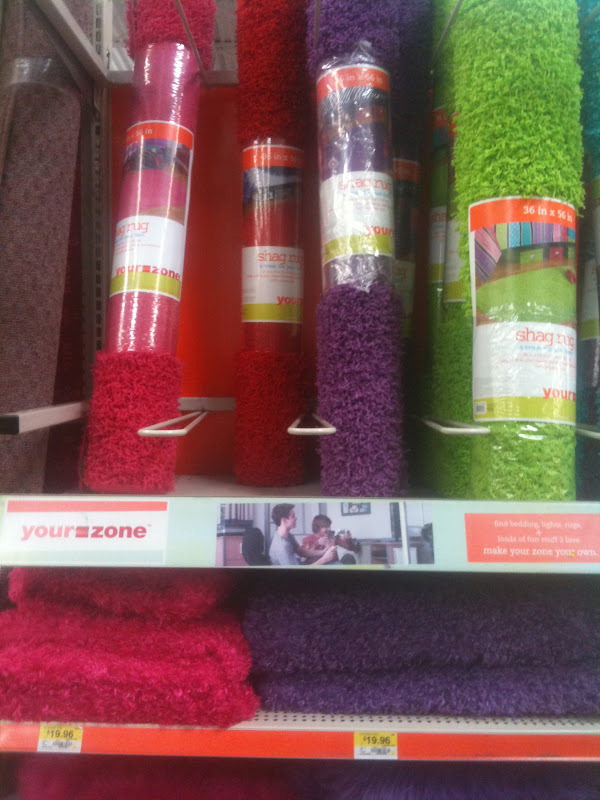 Everything in the Your Zone collection had a really youthful feel to it and the prices were great which meant we could get even more for the $200 we were spending. After she picked a few things out- I went to the store and shopped a bit more. and a couple fun accents I found too. A soft rich purple comforter just perfect for her cottage white bed. and a couple fun frames for her favorite pictures. before I got in there and took a before photo! lol! and put her own spin on her room. and is reversible to a plain dark purple if she decides that she likes that better. The drapes are soft white and they go perfectly with the purple. While the other one sits near her corner windows. and is really happy with her mini makeover. Last night she told me how soft her new blankets were and that she loves them. and that her mini makeover came out pretty cute. This shop has been compensated by Collective Bias #cbias as part of a social shopper insights study. I love it. My daughter's room is purple too and we are in the process of adding some new drapes and making a slipcover for her chair. Isn't it fun to help the kids design their own rooms. I enjoy seeing the colors they like instead of just white. I am so glad you posted this! My daughter is a pink/purple junkie, but has decided to paint her walls robin's egg blue. 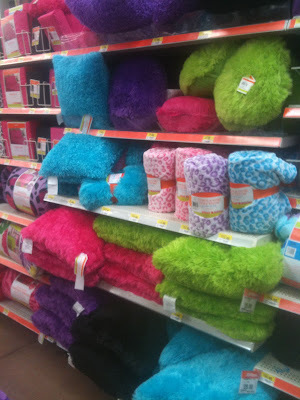 She still has lots of purple accents and we've looked everywhere for a bed covering. This will be perfect! GORGEOUS! SO pretty - a really great makeover! Wow Courtney! Fabulous! I could move in there and I'm all grown up! Love the furry rug...her girlfriends will be SO jealous!! I think it looks lovely just as it stands now, Courtney! My daughter had a purple phase, too. We did kind of a medium purple on the walls, but it still took two coats of primer and two coats of paint when we were putting our house on the market to cover it. This is much cuter. LOL. Nothing like a yummy,soft blanket. Look forward to the final reveal. That little side table is beautiful and fits right into her very feminine and youthful room! My daughter is into purple now too.We painted her room a light lilac color last spring.I like it and so does she.I love her room.It is gorgeous.She is one lucky girl. Her room is so pretty and it is always good that they love their room. Oh Courtney, your daughter is a lucky lady! What a beautiful room. I love the soft purple! I could, and would, love to curl up in there! LOVE LOVE LOVE The nightstand :) What a great makeover! What a cute room, and I like it that the purple is not overwhelming. Y'all did a great job, and that little table is seriously stunning! I love her room--it is so pretty! My 13 year old daughters room has black furniture, hot pink walls, and zebra print bedding. Not me at all, but their room should be all about them. I love that nightstand..those curtains are gorgeous. I love it all! Her room is so beautiful. It looks like a dream scape. She is going to love it! I love the way your room turned out! What girl wouldn't like to call that room home. Can you please post the name of the wall color. Thank YOU! R.I.P PURPLE PRICE OF OUR HEARTS.